This is a 6 ft. long, mini AV to mini AV cable. 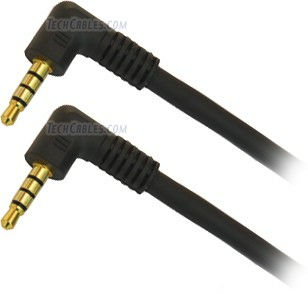 This cable has a gold plated 4-conductor (aka 4-pole or 3-ring) 3.5mm male plug on both ends, which is used to transmit both stereo audio and video, unlike standard 3.5mm plugs which are for audio only. It is commonly used to connect two devices that have mini AV jacks, however: SOME MANUFACTURERS WIRE THE JACKS DIFFERENTLY, AND THIS CABLE WILL ONLY WORK IF BOTH JACKS ARE WIRED THE SAME.